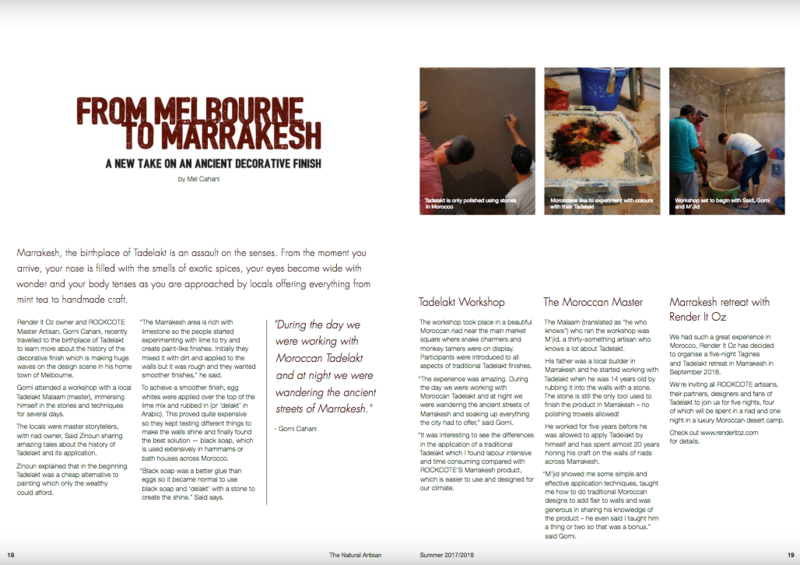 Render it Oz were thrilled to again be featured in the Natural Artisan Magazine, Summer issue 2017 with a story on Gorni’s trip to Marrakesh, Morocco to learn the ancient art of Tadelakt from the Moroccan Masters. Click here to go to the magazine and read the story or see the full excerpt below. Marrakesh, the birthplace of Tadelakt is an assault on the senses. From the moment you arrive, your nose is filled the smells of exotic spices, your eyes become wide with wonder and your body tenses as you are approached by locals offering everything from mint tea to mystical charms and handmade craft. Render It Oz owner and ROCKCOTE Master Artisan, Gorni Cahani recently travelled to the birthplace of Tadelakt to learn more about the history of the decorative finish which is making huge waves on the design scene in his home town of Melbourne. “I have been using ROCKCOTE’S Marrakesh product for a number of years now and it’s during this time my interest started growing around the traditional Tadelakt finish which ROCKCOTE’s product was born from. Organising a workshop with a local Tadelakt Malaam (master), Gorni said the locals such as riad owner Said Zinoun, were master storytellers who made the experience interesting from start to finish thanks to the amazing tales they told around the history of Tadelakt. Zinoun explains that in the beginning Tadelakt was a cheap alternative to painting which only the wealthy could afford. “The Marrakesh area is rich with limestone so the people started experimenting with lime to try and create paint-like finishes, they began by mixing it with dirt and applying to the walls but it was rough and they wanted smoother finishes. “To achieve a smoother finish, they started putting egg whites over the top of the lime mix and rub it in or ‘delakt’ in Arabic. This proved quite expensive so they kept testing different things to make the walls shine and finally found the best solution – black soap, which is used extensively in hammams or bath houses across Morocco. “The people found the black soap was a better glue than eggs so it became normal to use black soap and rub it in or ‘delakt’ with a stone to create the shine.” Zinoun says. The workshop Render It Oz attended introduced participants to all aspects of a traditional Tadelakt finish and took place in a beautiful Moroccan riad near the main market square where everything from snake charmers to monkey tamers were on display. “The experience has been amazing. During the day we were working with Moroccan Tadelakt and at night we were wondering the ancient streets of Marrakesh and soaking up everything the city has to offer. “It’s been interesting to see the differences in the application of a traditional Tadelakt which I found labour intensive and time consuming to ROCKCOTE’S Marrakesh product which is easier to use and designed for our climate. Translated as “he who knows”, the Malaam who ran the workshop for Render It Oz, M’jid is in his mid thirties and despite his youthful appearance – knows a lot about Tadelakt. His father was a local builder in Marrakesh and he started working with Tadelakt when he was 14 years old by rubbing it into the walls with a stone. The stone is still the only tool used to finish the product in Marrakesh – no polishing trowels allowed! He worked for five years before he was allowed to apply Tadelakt by himself and has spent almost 20 years honing his craft on the walls of riads across Marrakesh. “M’jid showed me some simple and effective application techniques, taught me how to do traditional Moroccan designs to add flair to walls and was generous in sharing his knowledge of the product – he even said I taught him a thing or two so that was a bonus.” said Cahani. “We had such a great experience in Morocco, we decided to organise a five night Tangines and Tadelakt retreat in Marrakesh in September 2018. “We’re inviting all ROCKCOTE artisans, their partners, designers and fans of Tadelakt to join us for five nights, four of which will be spent in a riad and one night in a luxury Moroccan desert camp. Details are on our website.” Cahani said. This article appeared in the Summer 2017 issue of the Natural Artisan Magazine.